Student/Military $10.00 With valid I.D. The Lido Theatre was opened in 1938, and the first film it played was Bette Davis in “Jezebel”. The reason for that was that Davis lived nearby in Corona Del Mar and traveled by the site daily. Upon stopping onsite, she told the owner “they had better open with my picture.” And they did. Davis also is responsible for the sitting parlor in the ladies room that harkens back to a time when women sat and smoked and chatted while arranging makeup in the mirrors. The parlor stools are period pieces and add such a wonderful touch. The poster cases are original, as is the tiny box office located outside the theatre under the Grand Marquis, and the Lido Theatre still uses manually dispensed real tickets instead of computer generated ones. The Grand Marquis is spectacular, with neon that lights the entire street, and painters and photographers can be seen daily in front of the theatre. Many companies rent the Grand Marquis to use in portfolios or in commercials, and it has been a popular site for film and television backdrops. Even the movie show on the TBN Network, “Master’s Theatre”, filmed it opening on the marquee, and in the projection booth and inside the theatre. The Lido Theatre has a waterfall red velvet curtain that rises with each show, and no pre-show advertisements are allowed by the owners. The Lido Theatre features independent film and commercial films, and has become a landmark for the independent and foreign genre. 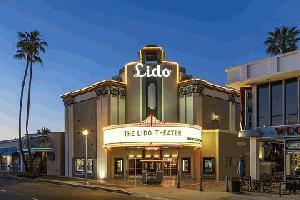 However, the Lido Theatre is only a block from the ocean, and surfers of all ages live in Newport Beach, so the Lido Theatre is also the surf film capital of Southern California, and runs a schedule of classic and new surf films. Many surf films, such as “Riding Giants” & “Step into Liquid”, have had their world premiere there, with a parade of Woodies bringing the stars to the front, where during surf premieres, they walk a blue carpet to the theatre’s doors. The Lido Theatre is also home for premieres of skateboarding, skating, and skim-board films. Regency Theatres also works extensively with the Newport Beach Film Festival, and the Lido Theatre is a location for prime features of the festival, which is held each April. Together, the Lido Theatre and NBFF also present cinema treasures, such as a yearly Christmas screening of “It’s A Wonderful Life” to families and children. The Regency Lido Theatre staff receives thanks daily from generations of families who attend regularly, and it is common to see grandparents, their children, and their grandchildren attending together, and rushing for the balcony seating! The Lido Theatre is located on Via Lido, just off Newport Boulevard as you cross over to Balboa Peninsula in Newport Beach. There are many restaurants and stores in the area, and directly across the street on the bay is Lido Village, a quaint and eclectic group of stores and restaurants. One block away is the pier and the fishing village, and of course, Newport Beach. The Lido Theatre prides itself on service, with each visitor being greeted upon arrival and thanked as they leave by being offered a special mint.